Shing's Adventures...: 308~Expect the Unexpected!! Few hours before the result of this 12th General Election was revealed...I didn't even bother to care about the outcome!! Coz I was pretty sure that there won't be much difference this year AGAIN...but...the fact is...there are times that we juz have to expect the unexpected!! Truth...nobody expected this outcome and we were all surprised and a lil' worried actually. Penang has fallen into the hands of opposition so...I suppose...the new government is gonna bring change to the Pearl of Orient...for better or worse...nobody knows!! What lies ahead for Penang's future?? In fact, we all know that many people are not quite satisfied with a lot of things and many is hoping for a CHANGE...and finally...mission accomplished! There's still a long way to go and will the new government and leaders bring CHANGE to Penang and benefit all Penangites?? Will the 2nd link,monorail & NCER project go on as planned?? Erm...dunno!! As long as we benefit...who rules also doesn't matter...hehe!! But at least this outcome is really a good wake up call for the present government...itz time to get out of the comfort zone and seriously do something about it!! 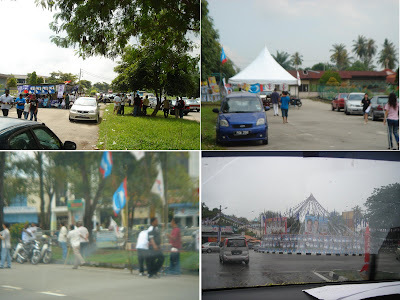 I received a call from 988's cruiser -- MinHui on Friday morning and she asked if I could help to bring the cruisers to a few voting centers in Penang to report about this election. Reason...because they are coming all the way from KL and weren't familiar of the roads here. I thought this should be a fun and good experience so agreed to help out (no pay for that). I met up with Winnie, Don, Junn and Acta at Pearl View hotel at 7am and started our journey! 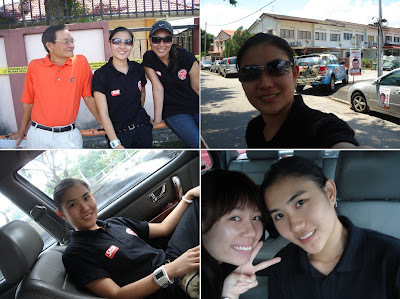 We were split into 2 teams to cover for 3 radio stations...988, Red104.9 and SuriaFm. 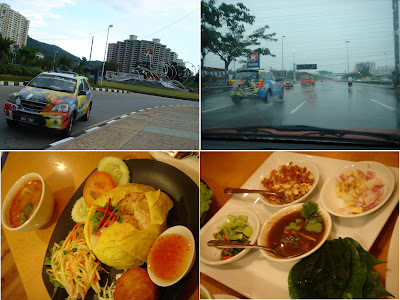 Our team stopped-by 4 destinations...Permatang Pauh, Tasek Gelugor, Batu Kawan and Bukit Gelugor. Basically, Winnie interviewed some voters to crossover to both radio stations and it was quite fun to see how they really did it!! I helped to distribute the newspaper at each stop and then juz see and feel the atmosphere of election day! We completed all 4 stops before lunch and after that went to Pulau Tikus and Air Itam before heading back. Overall, it was indeed a good experience and this was my first time getting more involved in the election...even though i'm still underage to be a voter...haha!! Took some photos but none of me in action...hehe!! Red104.9 colourful car (if you saw this car in Penang...i was inside oo!!) We had Thai food for lunch. Almost forgotten one extremely important thing...Wu Chun was here in Malaysia for the Romantic Princess promo on Friday and Saturday...BUT...I didn't manage to see him this time around...oouch!! So...I asked Bro to go on my behalf and get his autograph for the DVD!! Heard that it was raining quite heavily during the autograph session and it was quite chaotic there. Bro was selected to go onstage to 'act' and his group won!!! Yeah!!! 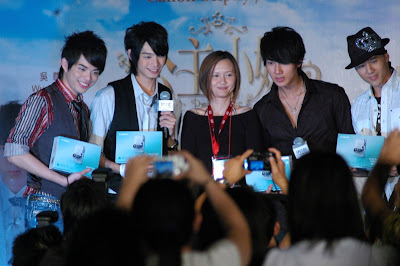 He was the only guy onstage so...a bit weird...but he did mention to WuChun that I'm the one who adores him very much but couldn't be there...and he also helped me to pass a 'letter' to him...hahaha~!!! Haven't got the photos from him yet...will post the photos after I get it next weekend!! Romantic Princess Promo in Malaysia! !